The Avalanche skaters did everything in their power to give the game away in the first 20 minutes. Philipp Grubauer, on the other hand, had other ideas. After allowing only one goal in a first period which was spent mostly in the Avs’ end, Grubauer held his ground to keep it tight the rest of the game – that is until the offense woke up in the third period, scoring two late goals to force overtime. 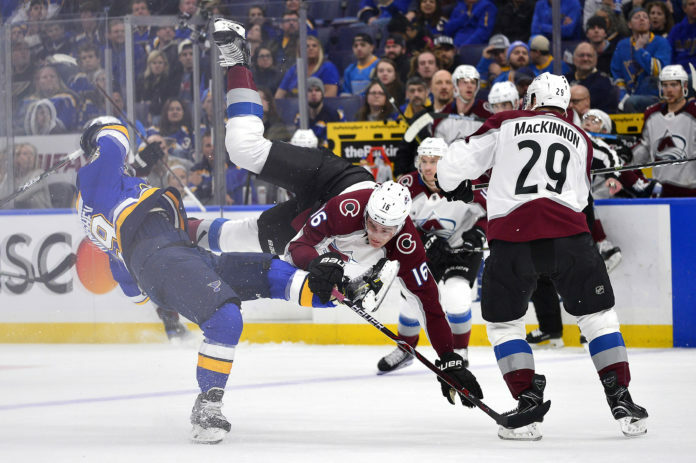 The Blues, the hottest team in the Western Conference over the last two months, ended up winning the game in a shootout by a score of 3-2, but the point the Avs managed to pick up may be crucial to their playoff hopes. The Avs now sit two points ahead of the Arizona Coyotes for the final playoff spot as both teams have three games left to play. The schedule makers decided to make this last week a grind for Colorado, as they now head home for a game tomorrow night against the Edmonton Oilers. That game starts at 7 PM MST. What did we learn from this one? It’s entirely possible that the first period against the Blues was the worst period the Avs have played all year. Colorado only managed to muster up 6 shot attempts in the period, while giving up 22. Jared Bednar used his coaches challenge to perfection, as an early Blues goal was taken off the board as they were found to be offside prior to scoring. Grubauer kept the Avs in this one, as they allowed a whopping 11 scoring chances in the first alone. Grubauer is showing no signs of slowing down, despite having started his career high eight straight game. With three games in the final five nights of the season, you have to wonder if the Avs continue to ride him, or if Semyon Varlamov manages to get into a game to give Grubauer a rest. It’s fairly clear that if the Avs make it, the German goaltender is their man in the postseason. Gabriel Landeskog might not be 100% healthy, as he played his second game since returning from injury, but he did his best to will this game to overtime. His net front deflection started the comeback halfway through the third period, and his perfect pass to Alexander Kerfoot would send it to overtime. The St. Louis Blues had one clear game plan in this game: neutralize Nathan MacKinnon. For most of the night, they were able to do so. MacKinnon did not register his first shot on net until late in the third period, and was a non factor most of the night. However, like most superstars, they don’t need a whole lot of room to create something, and MacKinnon almost won it in overtime with a power move to the net. While he didn’t pick up a point on Landeskog’s goal, Colin Wilson did a lot of the work to create it. He skated the puck out of traffic through the neutral zone and after dumping it in, worked hard to free the puck for Carl Soderberg. Moments later, the puck was in the back of the Blues net. Wilson has really picked up his game of late, as the games have gotten tighter and heavier. The slower pace seems to benefit him. He was solid in the playoffs last year, and the Avs will take any depth scoring they can get if they can get in.